I think I will never approve of their ways of protesting: I think it's plain illegal and that they are no worse than the whalers, with their piracy-ways-of doing things. I have become quite interested in how Sea Shepherd has been able to continue doing what is considered illegal in most of the world. The more I read the more it becomes clear that most nations are silently cheering them on and providing support. Australia and New Zealand seem to look for every loophole or crack in their laws to allow them to coninue operating. I assume their governments secretly applaud their work but do not whish to expend the political energy to challenge Japan on the issue. It's also becoming apparent that Sea Shepherd is like a lizard, able to drop it's tail to escape capture. Often the crew are sacrificed to the law. The individual crew perform the illegal actions "without knowledge" of the captain. A couple crew members get arrested but the organization continues on unharmed. They also seem to have the same approach with their ships. If a nation does happen to impound or hold a Sea Shepherd vessel they simply abandon the ship and move on. This partially explains why they have not purchased more modern, capable and expensive ships. They are disposable tools. This partially explains why they have not purchased more modern, capable and expensive ships. They are disposable tools. I agree, that is also why they do not seem to care about using their ships as battering rams. Just how they get away with it all I do not know. I do not wish to get involved with the politics, but their actions must be close to be terrorism of a type. Working at sea is often a risky enough job, and i really cannot see any reason why lives should be put at risk further. I feel it is only a matter of time before lives are lost if this behavior is allowed to continue. Using several hundreds tons of steel as a weapon is not acceptable behavior in my books. That is what really attracted my attention. These actions anywhere else, dealing with other less "popular" animals would be treated very seriously. Almost everyone agrees that whales are cool, probably more intelligent than the average fish, and that we really don't "need" to hunt them. The fishery for whales is small so the economic impact is negligible (almost nothing) and few jobs would be lost if whale hunting went the way of slavery. It's an easy cause to get behind. Screwing with another nations right to fish in the open ocean is a HUGE deal. I think most politicians do not want to handle such a sensitive issue and go out of their way to allow Sea Shepherd to do the dirty work. If you cross the bow of another vessel at close range you better be prepared, which they obviously were. I have to correct this post. 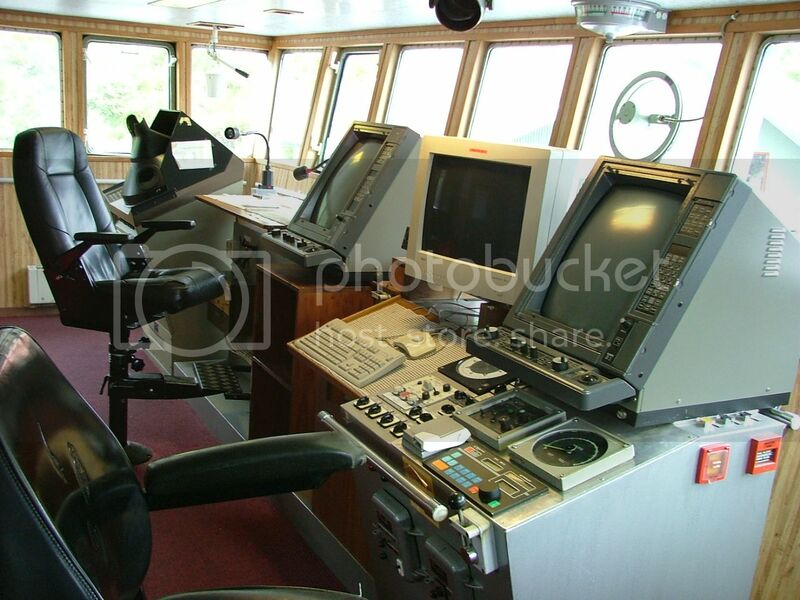 The Sea Shephard vessel "Bob Barker" is NOT ex. FISK, as I stated earlier, although similar and with a similar background. 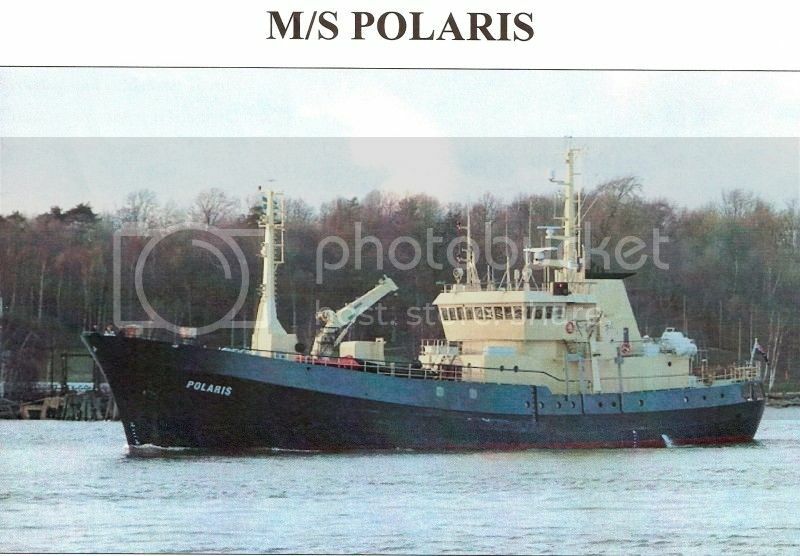 Just like the FISK, she started her life as the Whale Catcher (POL XIV, built in Fredrikstad, 1950. IMO No. 5280540) and converted to a a Purse Seiner in 1966. The name was "Volstad Jr." Owned by Einar Volstad PR and registerd in Aalesund. 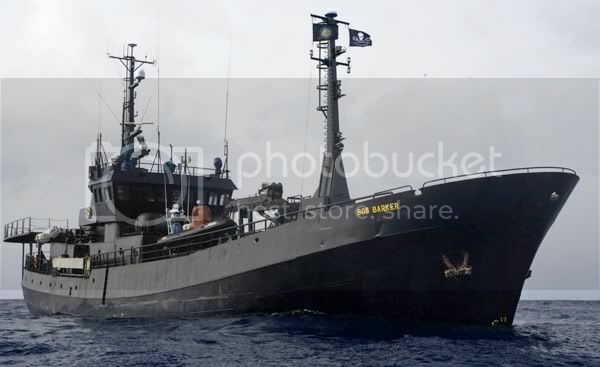 In 2009 she was purchased by Sea Shepherds while laying idle in West Africa and converted to their purpose, which was the direct opposit of her earlier task, chasing whalers, not whales. All new Navigation equipment and a very large fuel capacity, (580 Cbm)enabling her to stay at sea for extended periods. The comment under this last picture was: "He has the same ribbons as my little sister. He must have been a member of 4H too". To me he looks like a dressed up baboon and probably doesn't have a ticket to go with the title. The distinctions he is wearing on his sleeve, aren't they commonly used for pilots, not captain's? I guess anything goes when it comes to the title Captain these days. It took me 12 years to obtain that title, of which three years in Nautical Collage. At 27 I was among the youngest Masters at the time. Many would be in their forties, or even fifties, before getting their first command, even though they were holding the required license for years. The requirement was to have a Master Mariner education and hold an unlimited license, allowing you to "command ships of any type, any size, in any waters". But even that was not enough, you also had to hold, or have held, Command of a vessel to put the title Captain in front of your name. Today even the head waiter in a restaurant is called Captain. Some Bus Drivers in Singapore have been promoted to "Bus Captains", no less. I proudly use that title still and resent seeing it misuse by people that represent a danger on the oceans, and get away with it, because they hide behind some "good cause". I found some pictures from seasheperd when they rammed KV Andenes in 1994. On their homepage they have turned the story around and claims that it was "Andenes" fault, and that they where in International Waters. Last time I checked "Vestfjorden" was Norwegian waters (?)! 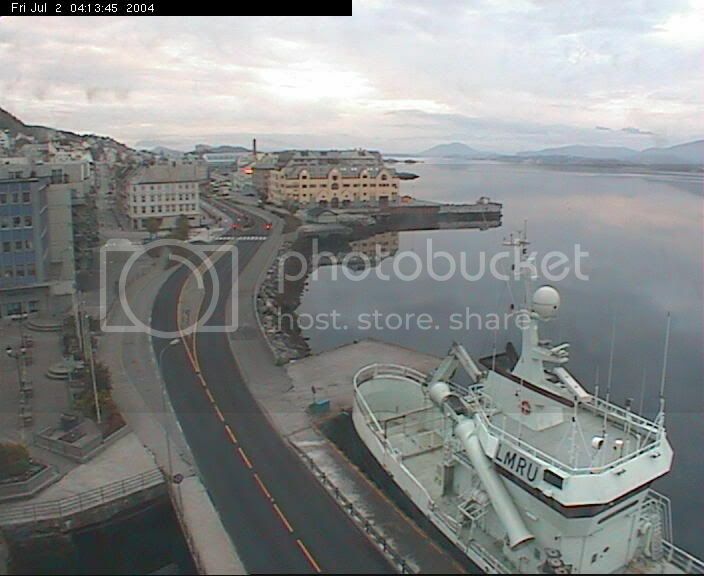 However the pictures shows that the Seasheperd has taken a "u"turn, and rammed Andenes from starbord. In my wild opinion, I think Seasheperds, much based on their seamen-ship in the TV documentary, is a group of rouge seamen, which does not necessarily know the proper rules of the road at sea. I also tend to think they have a distorted view of what is right or wrong, and capable of turning any situation to their favour. Seeing them hijack (jump on board a Japanese whaler) just to be able to say that they were kidnapped a few minutes later, makes me sick. Hooligans and pirates possibly. I do respect what they stand for, but i don't agree with their actions. The people who gives them money so they can carry on this way cant really have a clue about whats really going on when the ship leaves port. They actually gives money away so other "blinded" people could risk their lives with a crazy captain and a unexperienced crew with no respect for the sea and other working seamen what so ever. 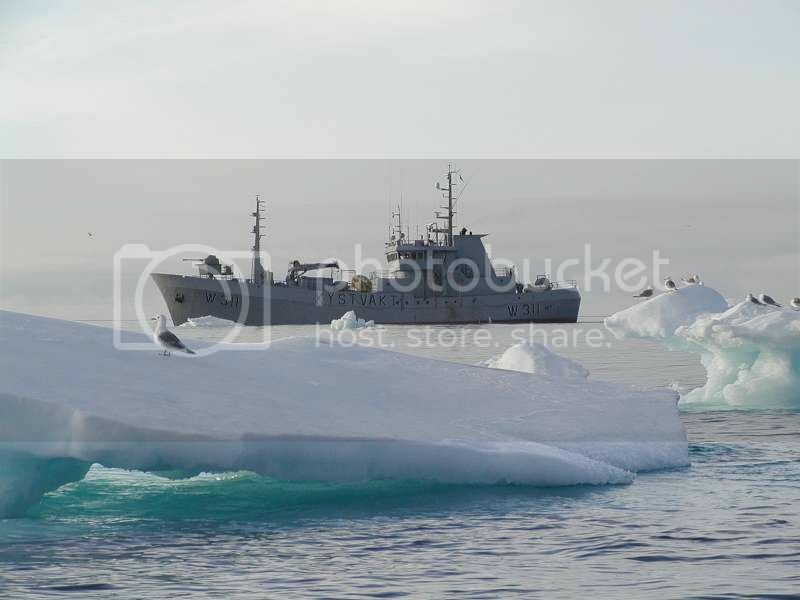 I think that in all the photos and video evidence i have ever seen concerning the sea shepherd colliding with other vessels, the evidence in every single case shows the sea shepherd to be at fault. And besides that, no commercial operator is going to deliberately damage their own vessel - they are on the sea to make money, not to loose it by deliberately damaging or risking the loss of their own ship. These guys are simply a gang of irresponsible criminals that should be banned from sailing the oceans before lives are lost. 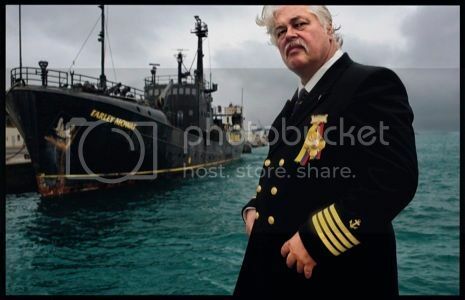 According to this article in Norwegian media, the captain of the trimaran Ady Gil which sunk after a collision with a Japanese whaler, states he was ordered by Sea Shepard General Paul Watson to sink the ship. Watson states it would be a great publicity advantage for them if they made it sink, so the Captain of the Ady Gil was ordered to sink his ship. Watson off course, like he does so many times in the TV show, doesn't take any responsibility for that at all, and just states that the Captain of Ady Gil is just upset because he is no longer affiliated with Watson's (terrorist...) group.